New Olympus camera coming in February? Weatherproof CSC with viewfinder on the way? Will Olympus' next camera feature a built-in viewfinder? Rumours are circulating that Olympus will launch a new compact system camera in February, which features weatherproof sealing and in-built viewfinder. Although originally thought to be unveiled at CES, a large consumer electronics show that kicks off in Las Vegas on January 10th, new reports now suggest that the second week of February will see the new camera revealed. Mock-ups of the camera have appeared on various websites, while detailed specifications are few and far between. What is known however is that it is likely to have an inbuilt viewfinder and the body will be weather sealed. 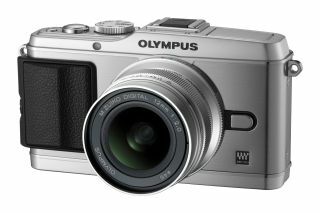 Olympus first launched the PEN series of compact system cameras in 2009, with the latest line-up featuring the E-P3, E-PL3 and E-PM1. None of the current cameras have viewfinders as standard, though they can be purchased as additional extras to slot into the hotshoe. Most CSCs don't feature a viewfinder, however recent cameras such as the NEX-7 and the Fuji X100 buck the trend. The X100 uses a hybrid electronic and optical viewfinder. Fujifilm is also set to announce a new camera at some point in 2012, and it is likely that this will also be in February. Speculation is that there is some sort of connection between the two cameras given the similar release dates. Stay tuned to TechRadar for more updates on any new Olympus cameras as they happen.